A section of William Hartnell’s 1965 Desert Island Discs interview (running for about 15 minutes) has just been returned to the BBC Archives, together with complete DID’s featuring the Reverend W Awdry, Diana Rigg and Louis Armstrong. The Louis Armstrong DID was Armstrong’s own personal copy, whilst the others have been donated by listeners. You can listen or download the Hartnell interview here or alternatively listen via the YouTube clip at the bottom of the post. Although it’s a shame that the DID excerpt cuts off just before he talks about Doctor Who, it’s lovely to have this chance to hear the man talk. 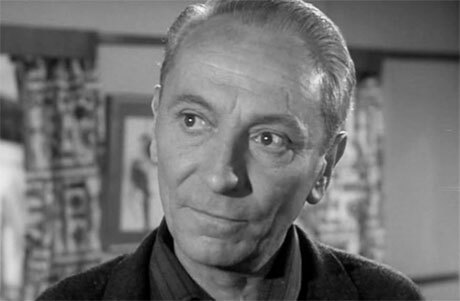 Audio or film interviews with William Hartnell are incredibly scarce – and this, along with the short film interview included on The Tenth Planet DVD, offer a rare chance to hear the thoughts of Hartnell, the man. Thanks to the wonders of the Internet, below is a transcript of the section of Hartnell’s DID that covers his conversation about Doctor Who. The material in brackets was excised from the finished programme. Hartnell: And playing this part, strangely enough, led to the part of Dr. Who. Hartnell: Because it so ha.. turned out that after playing Dr. Who for several months Verity Lambert, my producer, [ a very charming and lovable person, ] tol… finally confessed to me that she’d seen the film and she decided that there was her Dr. Who. Plomley: Yes. How long have you been playing Dr. Who? Plomley: Are they weekly instalments? Plomley: This is pretty hard graft, isn’t it? Hartnell: Yes. Rehearse all the week and tape them on a Friday. Plomley: And children do you find the toughest critics? Plomley: And it doesn’t worry you that after this you may be typecast again as absent-minded professors? Hartnell: No, my dear boy even if it’s in a bath-chair for the rest of my life. Plomley: [ Yes. Now this… this of course ] Dr. Who leaves you no time to do anything else. Plomley: So this is it for the foreseeable future. Hartnell: Yes, I think so. They’ve.. they give me pretty well carte blanche and as a matter of fact Verity has said that when the time comes we will give you a bath-chair free. Hartnell: So I said I might take her up on that one day. Plomley: Right well in the meantime while we’re still young and active let’s have record number five. Hartnell: Yes. Before I grow another white wig. [ Well now let’s.. let’s change the subject and the theme of music, shall we? I’d like to hear one of Louis Armstrong’s early records. I don’t know when he made it quite. But it’s a trumpet solo, and this.. this man I find fascinating. I remember him when I was quite young. And I think he’s what I call the king-pin of Jazz. And I think the, well I don’t know who else there would be to.. to.. to place in the same category. Anyway let’s.. I’d love to hear this record. Plomley: How long have you been playing Dr. Who? Plomley: Well this is really hard graft, isn’t it, one.. an instalment of that every week. Hartnell: Yes, but I enjoy it. Plomley: Do you like playing to children? Hartnell: I love them. I love children. Nothing gives me greater delight, because I.. I think they are the greatest critics in the world. Hartnell: Oh yes, oh yes, oh yes. When they write to me they demand sometimes over and above what I can provide, but I send them a photograph and sign it and answer some of their letters. And one little child wrote to me not so long ago, which is rather charming, she said that how much.. she told me in her letter how much she liked the show, and she ended up saying when I grow up I will marry you – aged 4 and a half. Plomley: Now does it worry you, Bill, that you may be type-cast again as an absent-minded professor? Hartnell: No, I shall enjoy that tremendously. Even if a bath-chair goes with it. Which brings me to the point of where Verity Lambert, my own producer, said that when the time comes she said we will produce a bath-chair for you – free. Plomley: Well this sounds as if you’re going to be doing Dr. Who for a good many years. Hartnell: Or am I afraid so? I don’t know. Plomley: It leaves you no time to do anything else. Hartnell: No, nothing at all – no. It’s once a week and we tape it every Friday.